Will Dormer (Al Pacino) is a LA Cop who, with his partner Hap Eckhart (Martin Donovan) have been sent to Alaska to assist on a horrible crime – a young girl, beaten to death. However, he is in trouble, under investigation back home. Arriving in Alaska to the midnight sun and with so much on his mind, he can barely sleep. Then, whilst chasing a suspect, things so wrong, and he is in a world of pain and confusion, and the whole time, feeling like he may lose his mind from fatigue. It’s a stunning film. Beautiful, clear Alaskan scenery. Clever storyline, well acted. Fabulous. I come and go with Al Pacino sometimes – but this here he gives such a strong performance. I know that sense of fatigue, the frustration that everything is getting on top of you, that you can barely hold your eyes open. He does everything but drool – and I guess toward the end it seems over the top, but I don’t mind. All I know is that I really, really wanted to get some sleep. 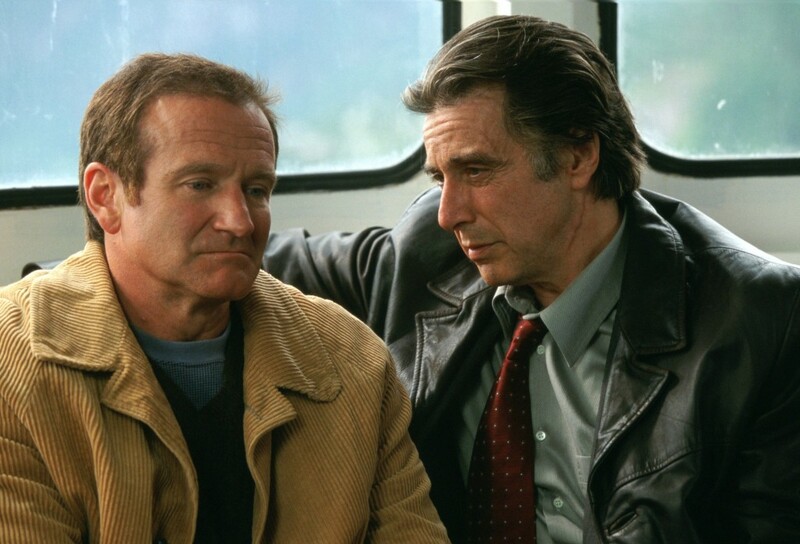 Then there is Robin Williams, so good at that gentle, disturbed kind of character.